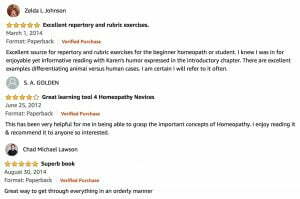 Ebook Homeopathic Repertory - Holistic Actions! 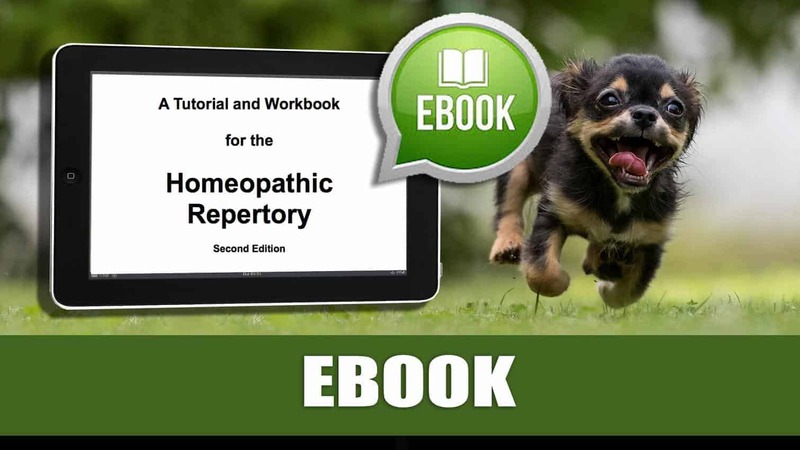 A tutorial and workbook for Homeopathic Repertory by Karen Allen, CCH with Christina Chambreau, DVM 2003. Homeopathy is a powerful medical approach for all species, especially when the time is taken to carefully find the medicine that most closely matches all the symptoms of the individual. To narrow down the choices from over 4,000 tested homeopathic medicines to a few to read about in more depth, an index of symptoms called a repertory is consulted. This tutorial book guides you through the organization of the repertory, chapter by chapter, rubric by rubric. Karen and Dr. Christina use humor as they explain how to find the medicines known to help almost any symptom for people and animals. Do you look for the rubrics with a lot of medicines listed or do you want ones with only 2 or 3? Each chapter has multiple human and animal symptoms for you to look up in the index – with answers! If your cat has red gums, where would you look? Is a dog’s front leg the same as a person’s arm? If your cat only vomits at 2 in the morning, can you find that? If a person stops itching only when they are standing in a hot shower, can you find that? Then, several strategies to cross reference the rubrics to narrow down your choice to a few medicines are presented. Finally, every section is full of case examples for you to practice your new found skills. One joy of working with the repertory is that you can find different rubrics if you ook at the case from your unique perspective. Some symptoms are clear, and there is a single rubric we all would agree upon. Other symptoms have multiple rubrics, especially for animal symptoms. The universal applicability of homeopathy is certainly demonstrated when you can find symptoms for birds, iguanas and fish, as well as mammals, in the Repertory. The homeopathic repertory opens its secrets with this workbook! Karen Allen takes you through the content and use of the repertory, step by step, so that you develop the ability to locate rubrics and repertorize a case, practicing your new found skills on the included acute and chronic cases. Since its introduction in 1994, this text has become the standard for learning repertory, widely used in homeopathic schools across North America. This second edition has been completely reviewed and revised. Additional information has been added, and Christina Chambreau, DVM, has joined with Karen Allen to include information about use of the repertory for veterinary cases. It now includes the previously published separate Solution Guide as an appendix. Karen Allen, RC, RSHom(NA), CCH has been practicing homeopathy in Seattle, Washington since 1994. She studied formally at the Pacific Academy of Homeopathic Medicine in Berkeley, California, and now teaches homeopathic repertory and case analysis for Bastyr University, In addition, she serves as president of the Council for Homeopathic Certification, a non-profit organization that offers a national certification in homeopathy.